In our previous post, we discussed the word sudar, and how it was formed from the Greek sudarium, which became סודרין in Hebrew. This word, however, was assumed to be plural due to the ending ין- and so the singular form סודר was created. Almagor-Ramon gives us another example of this phenomenon: the word kalmar קלמר - "pen case". It originally appeared as קלמרין kalmarin - with the same meaning of "pen case" or "inkstand", as in Mishna Mikvaot 10:1. From here we get another mistaken back formation of a singular - kalmar. She then writes that קלמרין comes from the Greek kalamarion. Klein points out that kalamarion derives from the Greek kalamos which meant "pen" and earlier meant "reed". This is the source of another Talmudic word - kulmos קולמוס - "(reed) pen". This word is part of the familiar expression כמה קולמוסין נשברו - "how many pens were broken", i.e. "how much was written (about) ...". The Arabic word for pen, qalam, has the same origin. Interestingly, "squid" is calamar in Spanish and similar in other Romance languages (calmar in French), and it is Kalamar in German. The source of these words is late Latin calamarium "ink horn" or "pen case", referring to the squid's ink, from calamus "pen". c.1350, schalmeis (pl. ), also schallemele (1390), from O.Fr. chalemie, chalemel, from L.L. calamellus, lit. "a small reed," dim. of L. calamus "reed," from Gk. kalamos. Mistaken as a plural and trimmed of its "-s" ending from c.1450. Today's is an original Germanic word, e.g. Dutch and German halm "stem," Danish halm "straw." It is akin to "culm" from Latin culmus "stalk," which is now used more to refer to the refuse of coal production, such as the lovely culm banks of central Pennsylvania. The original stem *k'olêm- also underlies Greek kalamos "reed," Serbian slama "straw" and Russian soloma "straw." The "semantic shift" of [Greek] kalamarion from 'pen case' to 'ink well' for which H. and R. Kahane bring evidence for Greek from Hieronymus, but ascribe it to Latin not earlier than the 8th century, is demonstrable from relatively early Rabbinical sources; interestingly enough, the earlier sources know this word only as a designation for the ink well. It is of course only in the latter meaning that this word could develop to denote, in modern Greek and other Mediterranean languages the cuttlefish (kalamari), by equating it to some kind of container of coloured fluid. "What's the origin of the term 'doogri'?" Arabic, in turn, borrowed the word from the Turkish dogru, presumably during the centuries of Ottoman rule over the Arabs. While normally I would try to connect the word dogru to a familiar word in English, this won't happen here. When I have a Hebrew word that traces back to Greek or Latin, or even Persian or Sanskrit, it has an Indo-European root - and English is an Indo-European language. Turkish, on the other hand, is one of the Turkic languages, of which other members include Azerbaijani, Uzbek and Tatar. There are those who place the Turkic languages in a larger group - the Altaic languages, which includes Mongolian and Korean. So if dogra isn't related to either Indo-European or Semitic, we more or less come to a dead end etymologically here. 10. /a/ toward, in the direction of. 11. /a/ toward, near the time of. 13. colloq. a correct answer (in a test). The word may also be familiar to you through the name of one of Turkey's major political parties - the True Path Party or in Turkish: Doğru Yol Partisi or DYP. Well, the results are in, and with your help I won the Best Jewish Religious Blog award! I would like to thank you all publicly - בפומבי b'fumbei. The word pumbei פומבי first appears in Talmudic times, and means "publicity". In modern Hebrew we also find the adjective pumbi - "public". It comes, through French, from the same source as pomp, which is Latin pompa. The Romans acquired the word from Greek pompe "a sending," coming ultimately from the root pempein "to send". Greek pompe came to be used figuratively for something that was "sent forth", namely a procession or parade. As such processions were often either very solemn or quite splendid, the notions of "a display" and then "an ostentatious display" came to be attached to the Greek word. Those meanings passed into Latin and eventually into English, though the "procession" meaning died out in English by the early 19th century, such that now the word carries only the "showy" meaning, which had taken on a negative air as early as Chaucer's time (the late 14th century). I'm still waiting for an solution for quiz #4, but lets take a look back at quiz #3. The word was חולצה - which can either be a shirt (top) - chultza, or "she was rescued" (like Jessica Lynch) - also chultza. That quiz (and this post) was actually meant for those who have recently started learning Masechet Yevamot, where another word from the same root is used often - חליצה chalitza - the removal of a shoe which came as the replacement for a levirate marriage. So lets look at the various meanings and derivations of the root חלץ. We'll start with Klein. He points out that there are two separate roots. One means "to draw off, draw out, withdraw, rescue, deliver". From here we get chilutz חילוץ - "rescue", and chalitza (the "drawing off" of the shoe.) Stahl points out that the Arabic word halas (which has entered Hebrew slang as well) meaning "finish, enough!" comes from this sense as well. The Arabic cognate halas means "finish, complete, remove". A third word is cheletz חלץ - "loin". From here Joseph Klausner coined the word חולצה chultza - "blouse, shirt", because "it is worn over the loins". Klein does not appear to connect any of the above three roots. Not surprisingly, others do. Jastrow places all the roots under one entry, but in an unusual way. He gives one meaning as "to surround, fortify; to gird, arm" and from here the meaning of "loins". The second meaning is the opposite of the first - "to untie, loosen, tear out; to strip, lay bare". He doesn't explain the development of the meanings - maybe this is an autoantonym like we've discussed before or maybe he's included two unrelated meanings under the same entry. For those that haven't noticed yet, I made it to the Finals of the Jewish and Israeli Blog Awards. As of this writing, it doesn't look like I'll end up first - rishon ראשון. But how bad would it be to be acharon אחרון ? For the answer to this, I'll turn to a book by Avshalom Kor, Higiya Zman Lashon הגיע זמן לשון (strangely translated as It's Time to Tongue), 1994. I found it in my local library, but since it has a number of very interesting articles about things I'd like to write about (and some insights about topics I've already discussed), I'd love to get my own copy. If anyone knows where I can find one - please let me know. "The glory of the acharon house will be greater than that of the rishon house". Hagai was trying to solace the people who saw the Second Temple being built, but remembered the First Temple and were disappointed. He was telling them that the Second Temple will be more glorious than the first. The Rashba (Rabbi Shlomo Ben Aderet, from thirteenth century Spain) tells about a debate he had with "one of the wise men of the Yishmaelites" with respect to the future redemption of Bnei Yisrael (responsa, volume 4, 187). The style of the debate was typical of the controversies of the Middle Ages, with both sides liberally quoting from traditional sources. "He replied to me from another angle, saying: The Torah states that there will be no Temple after the Second Temple (that is, the Temple will not be rebuilt), as is written, 'The glory of this last house (habayit ha'acharon) will be greater than that of the first' [Chagai 2:9]. See, the Second Temple is called the 'last house.' How could this be if another house will be built after it? "I replied: It is called 'last' only in relation to the first (that is, it is later than the first one, but not last in an absolute sense). This is similar to, 'He put the maid-servants and their children first, and Leah and her children last (acharonim), and Rachel and Yosef last (acharonim)' [Bereishit 33:2]. Leah and her children are called last even though Rachel and Yosef came after them. "He said: This is true when people talk... but when a prophet, who knows the truth, speaks, it is not so! I replied: No, it even appears in Divine words to a prophet. For example, the Almighty said to Moshe, 'If they do not believe the first sign, they will believe the last sign (acharon). And if they do not believe these two signs, take water from the Nile... And it will be transformed into blood on the ground' [Shemot 4:9-10]. As you see, the second sign was called acharon, even though the sign of the water (the blood) came after it." There are those who add a note from this week's Torah portion: "The blood will be a sign for you on the houses" [Shmot 12:13]. This is a hint that the sign of the blood, which came after the "last" sign, is a proof relevant to the "houses" - that is, a Third Temple will be built, even though the Second one that preceded it was called "last." Kor points out that the later "proof" is from the Shelah. I should mention that the meaning "last" does appear in the Tanach as well - see Shmuel II 2:26, 19:12. Israel Drazin and Stanley M. Wagner's book Onkelos on the Torah: Understanding the Bible Text. I only have the Bereshit volume of this English translation of Onkelos (there is also a Shmot edition), but it is very helpful for my work. It includes an English translation of the Torah text, based on Onkelos. Where Onkelos deviates from the plain meaning of the text, the English words are highlighted in bold. There is also an extensive commentary, explaining the reasons behind the Onkelos translation, as well as a comparison with other translations and commentaries. Dov Rappel's work "Targum Onkelos". This Hebrew book is a complete study of the approach of Onkelos, with such chapters as "The Theology of Targum Onkelos", "Targum Onkelos and the Midrash", "The Halacha and Targum Onkelos" and "The Literary Aspect of Targum Onkelos". While the book is meant to be studied straight through, there is an index of all verses mentioned, so you can find out if there is any interesting commentary on a particular translation. Dov Rappel was a professor at Bar-Ilan university, and a member of Kibbutz Yavne. I sat behind him in the Beit Knesset when I lived there, and found him to be a tremendous talmid chacham and a uniquely humble individual. He died in 2003 at the age of 87. Yein HaTov by R' Alter Vein. This book (as described here) "highlights every place where a Targum differs from the literal translation, translates the Targum back into Hebrew and sometimes explains the significance of the difference." A good resource, but it would be nice if the number of the chapter, as well as the name of the parasha appeared on every page. Lag B'Omer was a few days ago, but we're still talking about requirements for a bonfire. And as my kids will testify, you can't have a bonfire without marshmallows. But did you know that marshmallow may have a Hebrew origin? Marshmallow is one of those words that seems as if it should have a really interesting etymology, but is in truth rather mundane. A mallow is a type of shrub. It is a member of the mallow family, which also includes hibiscus, okra, cotton, and some other plants. A marsh mallow, as you are probably about to guess, is a variety of mallow that lives in marshy places. Althaea officinalis, if you're keeping track. It may surprise some to see that marsh-mallow occurs naturally and is not that unholy amalgam of nutrasweet and styrofoam without which no camp-fire would be complete. In fact, it is a species of mallow plant which grows near salt marshes. This marsh-mallow has mauve flowers but this should not surprise us as mauve means (in French) "the color of a mallow flower" (from the Latin malva "mallow"). 1398, from L. molochitis, from Gk. molochitis lithos "mallow stone," from molokhe "mallow;" the mineral traditionally so called from resemblance of its color to that of the leaves of the mallow plant. mallow, n., name of a plant. -- ME. malwe, fr. OE. mealwe, fr. L. malva, which, together with Gk. malache , of s.m., is borrowed fr. Heb. mallua h , 'mallow' (Job 30:4), derivative of melah, 'salt'; cp. Aram. milha, Syr. melha, Arab. milh, Akad. milu, 'salt'. (See H. Lewy, Die semitischen Fremdworter im Griechischen, 31 f., and Immanuel Low , Flora der Juden, I 227 ff. and 242 ff.) Cp. malachite, malvacious, mauve. Cp. also Malaga. Málaga, just like the other towns on the Costa del Sol, was settled by Phoenicians in ancient times, around the 7th to 8th century BC. Records indicate that the area was originally named "Malaka" from the Phoenician word for "salt." Because of the area's proximity to the sea, it became an important fishing center. Fish was salted and served as a staple food source for the local inhabitants. This is also the main reason behind the town's original name. The American Heritage Dictionary also connects mallow to melach, although I should mention that some say that the word derives from "the Greek malake/maluke 'to soften'". Yesterday was Lag B'Omer, and of course we had a bonfire. Let's look at some of the foods eaten at a bonfire. We've already talked about naknik, so let's talk about another word - shipud שיפוד - "skewer". We find the word in the Talmud as שפוד shapud (or shefod or shefud) with basically the same meaning - "spit for roasting meat". A derivative is the verb שפד - "to put on a spit". Everyone seems to agree that the word derives from the Greek spodos (no one suggests a connection to "spit" in English - it has a different etymology.) . Klein writes that the word is "borrowed from the Greek spodos (spit for roasting meat.)". Steinsaltz (Avoda Zara 75b) gives the same definition of the Greek word. French spodumène, from German Spodumen, from Greek spodoumenos, present participle of spodousthai, to be burned to ashes, from spodos, wood ashes (because the mineral becomes ash gray when exposed to air). So what's happening here? Ben-Yehuda does mention a theory that perhaps the word came from some language other than Greek, for Greek does not have the "sh" sound, and had it been from Greek it should have been spelled ספוד. But he does start by saying the word derives from spodos, and doesn't give any indication that spodos meant "ashes". Well, you solved the last one pretty quickly. I thought I'd try something a little new here at Balashon - a game I've decided to call Kri and Ktiv (Read and Write). I will provide two hints in English, each referring to a Hebrew word. Both Hebrew words will be homographs of each other. The goal will be to figure out what Hebrew homograph I'm describing. I'm thinking of the Hebrew עמוד - amud meaning "pillar" and amod meaning "stand up". 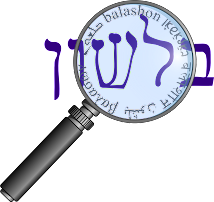 You should know that the Hebrew word can be spelled with full or partial vowels, and the meanings (the hints) can refer to Biblical, Talmudic, Medieval, Modern Hebrew or slang. Put your answers in the comments (if you can't type in Hebrew, just spell out the letters). The first one to get it right will get their name (and site link if they'd like) in the sidebar!